Robbie Stanger beat Kevin Gray 5-2 to win the ER&T Craigie Butchers Singles. The Tankerness Hall was the new venue for the ranking points competition. A huge thank you to the sponsors Eddie and Thorfinn Craigie for their generous support once again. A big thank you from the darts league also goes to all the Tankerness lads who put the venue together for darts and ran the bar. An excellent venue! High finishes were a 167 by Kevin & 148 by Graham Reid. 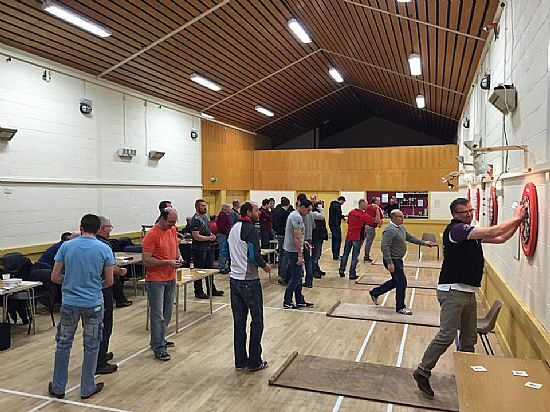 The new venue for the E R & T Craigie singles proved very popular as 34 top players made their way to the Tankerness Hall for the ranking points event. Of course with most of the top contenders present, some big names didn’t make the points region, and of the nine ‘B’ players who entered, only one made the mark with Robbie Norquoy getting three points. But it was the other Robbie who was making all the headway, with Robbie Stanger storming into the final. The defending champion, Kevin Gray, wasn’t at his best but he still made the final, and in the final not many would have bet against him as took the first two legs, one with a great 167 checkout. He then just fell off the rails as his usual big scoring deserted him which allowed Robbie to take the next five legs for a well deserving 5-2 win. With so many players failing to score points, its wide open in the table. In fact, Robbie and Kevin are the only two players sure of a place in the team, but with 18 points still up for grabs, a dozen players are still in with a chance. The table is: Robbie Stanger, 39 points; Kevin Gray, 38, Ivan Leslie, 22; Ian Linklater, 21; Stevie Linklater, 20; Alan Gray, 18; Ian Findlay, 18; Derek Firth, 16; Ryan Tulloch, 13; Bruce Moar, 12; Craig Taylor, 12; Leigh Shearer, 11; Jim Brown, 11; another 21 players have points ranking from 10 to three. Next ranking event, the league doubles in the 10 March, but before then the ‘B’ boys have their own ranking point’s event on Friday night in the Legion with the Albyn Shield singles. Names in by 7.30pm. Also it's Saturday, February 11 all the players should be looking out for as the KDDL hold the first of their 50 year anniversary celebrations with the Golden Singles in the Legion. Names in by 1.30pm and its open any player, male or female, who has played for a league team in Kirkwall over the 50 years. 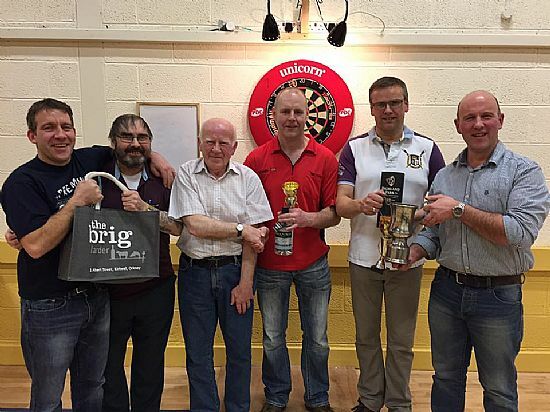 Both the Williamsons dart leagues got underway after the break and the top game in the ‘A’ league matched the top two, and it was the Legion who increased their lead with a 9-3 defeat of the Commodores. That was the top score along with Sanday who beat the Wanderers 9-3. That left the Wanderers just above the relegation zone. Both the Untouchable teams shared the points as they drew 6-6, and good for the Warriors 8-4 out at the Sands – it keeps them up near the top of the ‘A’ league. No score from Legion Arrows and Quoyburray ‘B’ game. It’s very close at the top of the Williamsons ‘B’ league as the top teams all played each other. Shapinsay the league leaders were held to a 6-6 draw by the Nomads and it was the same score in the Tankerness v Murray Arms game, so no change at the top. The Vikings moved a little closer with a 8-4 defeat of the Muppets and very welcomed points for the Motorhoose 9-3 over the St Ola ‘B’ who still to get a point. The other St Ola team lost out 7-5 to the Bilco Boys. 180s from Alan Gray, Graham Louttit, Derek Firth, Leigh Shearer, Stevie Moar, Colin Barnett, Wayne Small, and two from Jamie Marwick, Gary Wilson, Ian Linklater, Ryan Tulloch, Neil Croy, Kevin Gray and Robbie Stanger. Three from Brett Dickinson and four from Ian Wilkie. High checkouts of a 101 Raymie Rendall and Andrew Moar, 108 Ian Wilkie, 114 Colin Leslie, Gary Wilson and James Flett, 115 Stevie Moar, 119 Brian Moar, 121 Colin Barnett, 148 Graham Reid, 154 Trevor Shearer, 160 Ivan Leslie and 167 Kevin Gray. Sanday 9, Wanderers 3; Legion 9, Commodores 3; Legion Arrows v Quoyburray ‘B’ – no score; Sands 2 4, Warriors 8; Untouchables ‘A’ 6, Untouchables 6; no game – OGC. Shapinsay 6, Nomands 6; St Ola ‘B’ 3, Motorhoose 9; Vikings 8, Muppets 4; Tankerness 6, Murray Arms 6; Bilco Boys 7, St Ola 5; no game – Quoyburray. Legion v Wanderers; Legion Arrows v Sanday; Sands 2 v Commodores; Untouchables ‘A’ v Quoyburray ‘B’; OGC v Untouchables; no game – Warriors. St Ola ‘B’ v Muppets; Tankerness v Vikings; Bilco Boys v Motorhoose; Quoyburray v Murray Arms; Nomads v St Ola; no game – Shapinsay.